Pick up rental car. Drive to Ek Balam, a Mayan site which has been carefully restored and shows spectacular frescos. Close to Valladolid you can have a swim in the mysterious Cenote Dzitnup with its million year old stalactites and stalagmites. Nearby Chichen Itza are the intriguing caves of Balankanche, which are worth visiting. Overnight at Hacienda Chichen, Chichen Itza. Visit of the archaeological site of Chichen Itza with is famous Kukulkan pyramid, Temple of the Warriors, Ball Court and Observatory. Close by is the lovely Cenote Ik-Kil which invites for a refreshing swim. Drive to Merida. 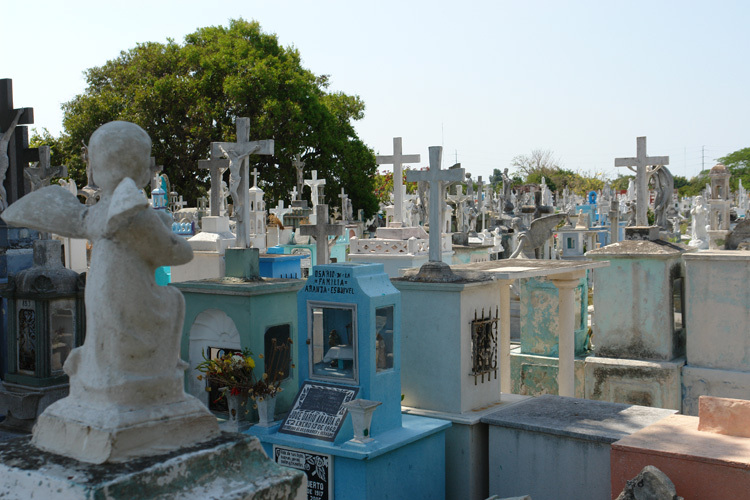 Enjoy late afternoon in the lively capital of Yucatan with its colonial buildings, shady parks and friendly people. Overnight at the Hotel Casa del Balam, Merida. City tour of charming Merida: the main attractions are grouped around the Main Plaza (Zocalo) like the Governor’s Palace, the oldest Cathedral of Mexico, and Montejo-Palace. 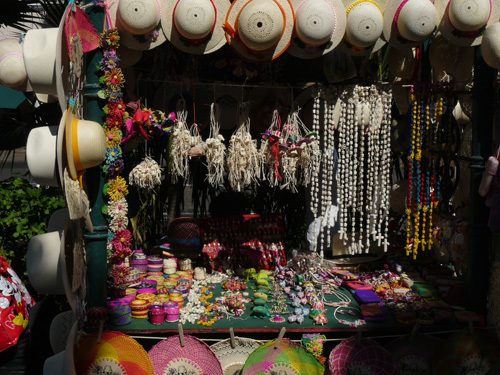 Close by is the colourful local market. Drive on country roads to the quiet fishing village Celestun right on the Gulf of Mexico. By a sandy dirt road, you reach the Hotel Eco Paraiso Xixim, Celestun where you stay overnight. Take a boat trip into the lagoon of Celestun, home of many birds starred by pink Flamingos! After enjoying a fresh seafood lunch in a local restaurant, drive back to Uman and head south. Worthwhile visiting is the old Henequen hacienda of Yaxcopoil which is well signposted. Soon after you will get to the Luxury Hacienda of Temozon, which has been carefully restored. Overnight at Hacienda Temozon, Temozon Sur. Enjoy a peaceful morning in Temozon and explore the magnificent Hacienda. Drive via Muna to the typical Yucatek town Ticul where you find nice pottery. Via Oxkutzcab you reach the impressive cave system of Loltun and the enchanting sites of Labna and Sayil. Late afternoon arrival in Uxmal. In the evening, you can enjoy the Sound &Light show in Uxmal. Overnight at The Lodge Uxmal, Uxmal. After breakfast, walk across the road to the entrance of Mayan site Uxmal, which was once the regional capital of the Mayans. Outstanding architectural jewels wait to be explored like the Pyramid of the Magician, the Nunnery & Governor’s Palace. South of Uxmal is another example of the vanished civilization: 25 km down the road you will reach Kabah with its unique Temple of the Masks. 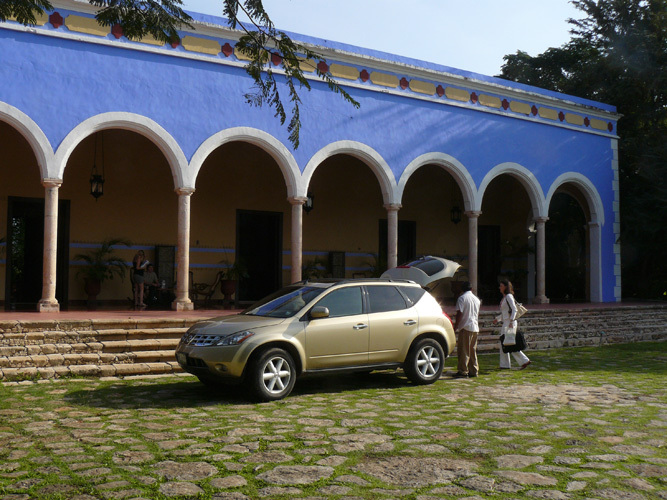 Drive back to Merida and heading direction Tixkokob, you will find the entrance to the Luxury Hacienda San Jose. Overnight Hacienda San Jose, San Jose Cholul. 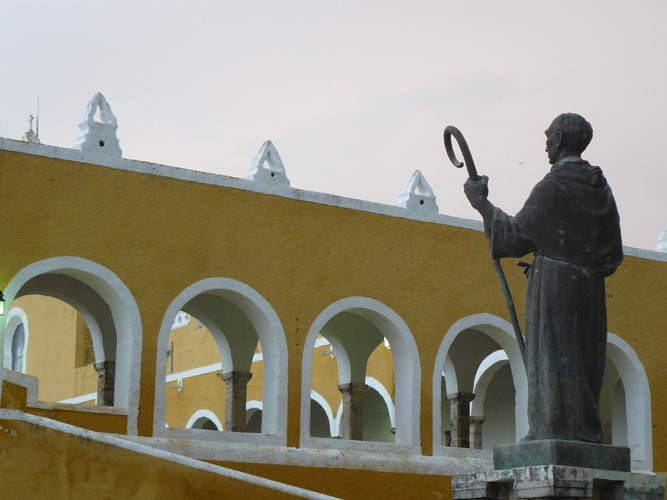 Drive to Izamal, the City of three Cultures and visit the dominant Franciscan convent. Take a relaxed city tour in a horse carriage and climb the huge “Firebird” pyramid. Next stop: the colonial town Valladolid. Visit the sisal convent, the main square with the fortified cathedral and the cenote Zaci. 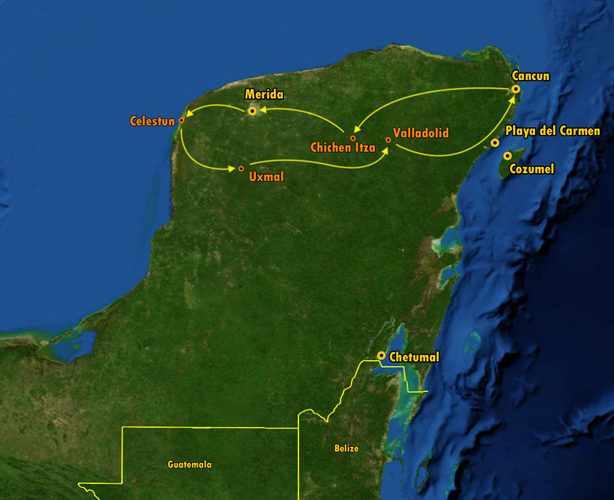 Drive via Chemax and Coba to Tulum and visit the old Mayan port built on cliff overlooking the Caribbean Sea. Drive to your beach hotel in Cancun or the Rivera Maya, return of rental car.